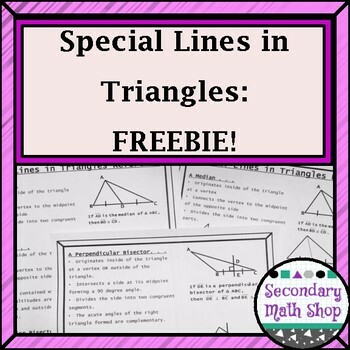 Special Lines In Triangles Short Review/Practice Freebie! NEWLY REDONE - COMPLETELY REDRAWN!!!! This documents contains an overview of the properties of medians, altitudes and perpendicular bisectors in triangles as well as diagrams. Version One: A single page document that includes the properties of the three special lines and a labeled diagram for each. I have also included a fill-in-the-blank version for note taking. Version Two: A two-page document that includes the properties of the three special lines, a labeled diagram for each and practice examples (2 median, 2 altitude and 4 perpendicular bisectors) with each type of special line. I have also included a fill-in-the-blank version for note taking. I did not include any problem or information about orthocenters, circumcenters or centroids. Special Lines In Triangles Investigation and Practice Worksheet. Special Lines In Triangles Riddle Worksheet. 2014-15 Secondary Teacher Binder Black and White Polka Dot Theme. 2014-15 Secondary Teacher Binder Vine Black/Gray Theme. 2014-15 Secondary Teacher Binder Stained Glass Black/Purple Theme. 2014-15 Secondary Teacher Binder Stained Glass Blue/Gray Theme. 2014-15 Monthly Calendars and Weekly Planning Maps/Overviews Black and White Polka Dot Theme. 2014-15 Monthly Calendars and Weekly Planning Maps/Overviews Black Purple . 2014-15 Monthly Calendars and Weekly Planning Maps/Overviews Gray Blue. Geometry Beginning Concepts Unit Vocabulary Assignment and Puzzles. Geometry Basic Concepts Segment Addition Postulate Task Cards. Geometry Basic Concepts Angle Addition Postulate Task Cards. 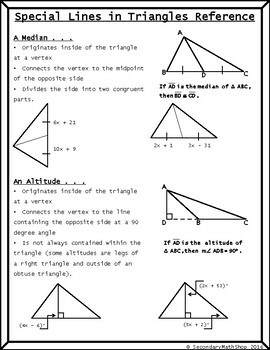 Geometry/Algebra Basic Concepts Coordinate Distance and Midpoint Task Cards. 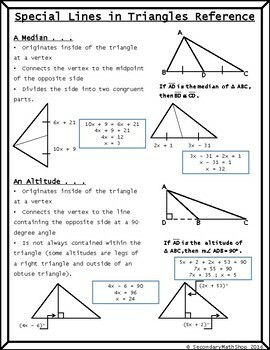 Geometry Basic Concepts Angle Relationships and Measures Task Cards. Money Saving Task Card Bundle!!! Beginning Concepts Task Card Bundle. Geometry Basic Concepts Parallel Lines Angles Note Cards. Geometry Early Concepts Bingo Game. Geometry A Unit One Beginning Concepts Bellwork-Bellringers. Geometry Segment and Angle Addition Postulates Riddle Worksheet. Geometry Angles Formed by Parallel Lines Riddle Worksheet. Algebra Distance Formula Practice Riddle Worksheet. Basic Concepts Word Wall Posters. Proof and Logic Word Wall Posters. 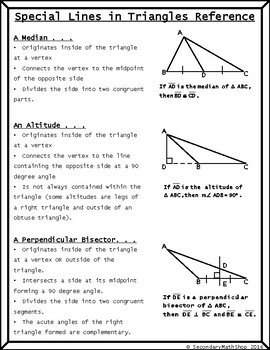 Geometry Classifications of Triangles Special Lines and Angles Formulas Wall Cards. Methods of Proving Triangles Congruent and Similar Wall Posters. Angles Classifications Pairs Parallel Lines Relationships Wall Posters. Geometry "A" Wall Poster BUNDLE! Geometry "A" Wall Poster BUNDLE!.